Successfully Added Smart Pointer, Built-in Memory 512MB to your Shopping Cart. V8 Pointer functions as a remote control, a wireless mouse and a laser pointer When using Microsoft Powerpoint, it allows for seamless presentations. Pointer functions as a laser pointer and a PC remote control. It enables you to make presentations without any assistance. Smart Pointer operates like a keyboard or a mouse, allowing you to "enter" or "point and click". Smart Pointer can control multimedia programs such as Windows Media player as well as MS powerpoint. Smart Pointer consists of a Transmitter and a Receiver. The Transmitter has 6 input buttons, 1 switch and 1 laser button. 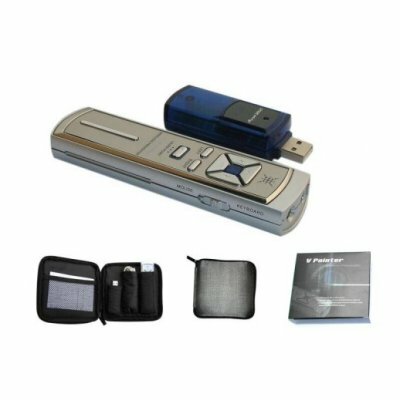 The Receiver consists of USB Plug and LED.